Very topically, Thompson has written a story about the use of animals in genetic experiments. In this case, Laurie’s Dad has to create a virus that will target grey squirrels but not harm reds. Laurie and her brother become suspicious, however, of the true motive of the mysterious Mr Davenport, who is in charge of the project, and of the large financial reward that will be paid when it is completed. Their suspicions are fuelled by strange sightings of three mysterious horses, their riders carrying a bow and a balance, and by the civil unrest in a Muslim country with growing fundamentalism. 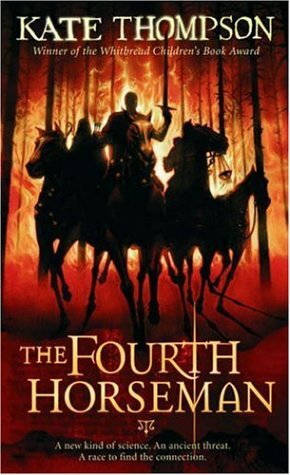 As the three horsemen are joined by the fourth, they realise the apocalyptic portent of what they have seen, and a sinister political reason for Mr Davenport’s urgency.